Karvy is an integrated financial services company that straddles multiple spaces ranging from stock and commodities broking, transaction processing, data management, lending etc. While its focus has been in providing services in the financial sector, it also provides services in the banking, insurance, telecom and government spaces. The Karvy Group has over 12000 people spread across 480 branches in India, and every 6th Indian is serviced by Karvy. A logical extension of our work would be to provide services that cover the entire spectrum and lifecycle of data. This led to the development of the market research arm of the organization. We see it not so much as foraying into a new, uncharted space but extending our line of services and products to encompass the entire spectrum of data. 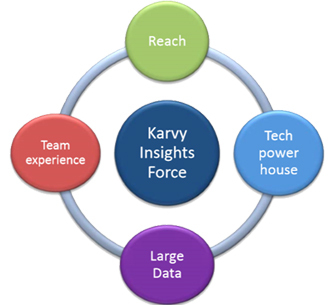 Karvy Insights (KI, pronounced ‘key’), is the market research arm of the Karvy Group. It is a full-service market research and insights organization.